In large bowl, beat shortening and butter with electric mixer on low speed until smooth. Gradually add powdered sugar, 1 cup at a time, beating until combined. Add vanilla and 2 tablespoons of the liqueur; beat until blended. Add enough of the remaining 1 to 2 tablespoons liqueur, 1 teaspoon at a time, beating until frosting is light and fluffy. Spoon frosting into decorating bag fitted with #1M star tip; pipe frosting in circular pattern on tops of cupcakes. Success: If you are using 2 (12-cup) muffin pans and baking all the cupcakes at one time, rotate the pans halfway through the baking time to ensure even baking. Tip: If you do not have a decorating bag? 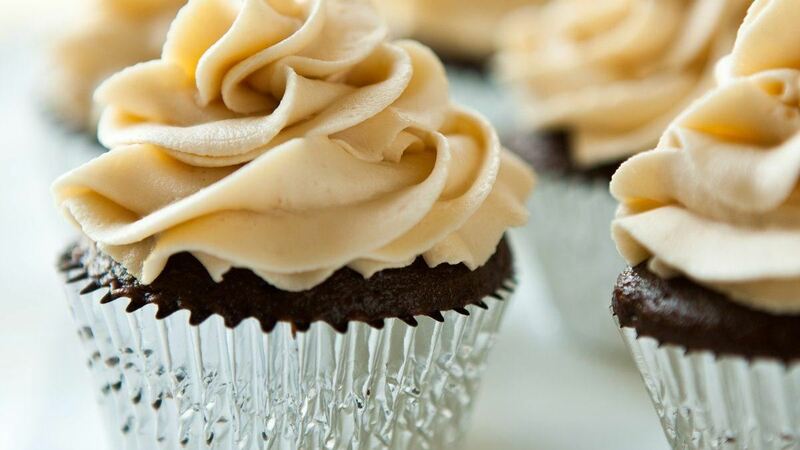 Simply spoon the frosting into a large resealable food-storage plastic bag and cut off a corner of the bag to pipe frosting onto cupcakes.